At Access Denied, we have a large team made up of professionals and this is what allows us to provide a range of services as a locksmith in Hatfield. We provide services to those who are locked out of their homes, businesses and vehicles. We’re even able to provide replacement locks and spare keys to those who need them. When it comes to finding a locksmith in Hatfield, there’s no need to look any further than the Access Denied team. By providing a full range of services, we’re able to confidently think of ourselves as one of the best locksmiths in the area. Whereas some companies focus on providing auto locksmith services or locksmith services to properties, we do both. We do this because we know that finding a locksmith in Hatfield isn’t always easy, especially if you want one with a high level of professionalism. So, by providing a full range of services, our customers can use us for all of their locksmith needs. Whether it’s a snapped car key or a lost house key, Access Denied can fix the problem. At Access Denied, our main focus is on providing the very best service that we can; it’s what our customers deserve. When you spend money on a locksmith in Hatfield, you’ll want to get your money’s worth. This is why everyone at Access Denied goes above and beyond. Rather than simply being a locksmith in Hatfield, we pride ourselves on being experts in our field. With such a wide knowledge and a lot of experience, there’s no locksmith problem we cannot fix. Whether it’s a problem with a car key or a property key, we work quickly. We know that being unable to access a car or your home is a huge problem, especially if you have things to be doing and places to be going. That is why we always aim to complete our work as quickly as possible. However, this doesn’t mean we compromise on quality. Every service we provide is of the highest quality. To find out more about Access Denied, get in touch. Nobody wants to find themselves locked out. As well as being a pain, it can hugely impact your day. After all, if you’re locked out the chances of you having the productive day that you planned are slim. Plus, if you’re locked out of your car, you can say goodbye to driving to work or to collect the kids from school. Unfortunately, it’s extremely easy to lock yourself out of your vehicle or property. Luckily, if you do, we’re on hand to help. If you find yourself locked out in Hatfield, Access Denied are just a call away. At Access Denied, we have a large team of professionals who are always on standby; this means they’re able to help at any time. Regardless of when or where you find yourself locked out, a locksmith in Hatfield is only moments away. We know how stressful being locked out can be and it isn’t a problem you can solve yourself. Unless you planned ahead and have a spare key to hand, there’s very little way to access your home or property. This is why it’s vital that you call in the experts. As professionals, we’re able to gain access quickly and easily. We don’t recommend doing this yourself, as you’re likely to do more harm than good. However, with our specialist tools and state of the art equipment, we’re able to gain access and let you in without causing any further damage to the locks. Then, we’ll be able to provide you with a replacement key to ensure the problem doesn’t happen again. At Access Denied, we’re confident in our ability to provide the very best locksmith in Hatfield service. Whether you call us for a minor problem or something much more serious, we’re always able to help. Plus, as we’re completely mobile, we’re able to travel to you. This means there’s no need for you to worry about finding your way to us or waiting days for a call out. Instead, we can get there easily. You may need a lock replacement in Hatfield for a number of reasons; perhaps you’ve recently moved and you need new locks or maybe you’ve recently lost a key and want to change the locks for security purposes. You may even just want to upgrade your existing locks into those that are a little more secure. Whatever the reason for needing lock replacement in hatfield, we’re able to help. At Access Denied, we work hard to provide a full lock replacement service to our customers. This includes replacing locks in vehicles and properties. Simply, you can count on us regardless of your lock replacement needs. Having been working as locksmiths for many years, we have built up a reputation for being a skilled and experienced team. This is something we’re immensely proud of and something we always uphold; it allows us to provide a professional lock replacement service every time. At Access Denied, we know that needing a lock replacement can cause stress. A lot of people assume that having locks replaced on a car or home is a long and drawn out process. We’re here to tell you that it’s not. In fact, with the right team of experts, replacing locks can be just as quick as other locksmith services. There’s no need for hassle or disruption, replacing locks can be easy and efficient. Instead of taking our time, everyone at Access Denied works hard to have the job completed in record time. As we are completely mobile, we’re able to travel to you with ease. This means there’s no worry of you needing to visit us or having to wait for days at a time until a call out becomes available. Instead, we’re always ready to head out and to wherever you are. However, being mobile doesn’t mean we’re unable to provide an unmatched service. In fact, thanks to our state of the art equipment and modern technology, our service is one of the best. If you have any questions about lock replacement in hatfield or you’d like to know more about what we do here at Access Denied, get in touch. A member of the Access Denied team is always able to help. You’ve probably given very little thought to whether or not you’re car key or house key is at risk of snapping, as very few people do. However, a key snapping is not uncommon. In fact, it happens to a lot of people. Of course, those with a spare key don’t need to worry and the problem is easily solved. Though, what happens if you don’t have a spare key? If you find yourself with a snapped key, it’s best to call in the experts. At Access Denied, we’re able to help. We pride ourselves on offering a full range of locksmith services; this includes issuing replacement keys, changing locks and gaining access when a key is lost. This full range of locksmith services also extends to include helping out when a key snaps. At a professional team of locksmiths, we believe it’s important for us to offer a wide range of services. This means that our customers know they can come to us time and time again, for many different reasons. There’s no need to seek out a new locksmith in Hatfield. When a key snaps, a mountain of problems can occur. For example, with a snapped key there’s no way to drive your vehicle and this can put your entire day into chaos. Similarly, with a snapped key there’s no way to get into your home; this in itself is a stressful situation to be in. Luckily, we can fix the problem quickly. Within moments of you contacting us, a member of the Access Denied team will be on their way to you. Then, once they arrive, they’ll work quickly to ensure you’re able to get on with things as soon as possible. Whether it’s a key snapped in Hatfield or you have another need for a locksmith in Hatfield, we’re always available to help. The team at Access Denied are dedicated to helping out our customers whenever they can, which extends to include answering questions and queries. For more information on finding a locksmith, get in touch. Call us today on 07534 277020 for a no obligation quote or for more information on any of our services. Alternatively, get in touch online. This is not a problem and is the most common reason we get calls. Our non-destructive methods of entry mean we can open your car in no time at all. Call us now for a call out in as little as 30 minutes by one of our Hatfield Locksmiths. 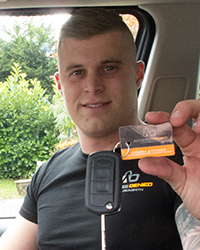 Access Denied Hatfield Auto Locksmiths can provide new keys for your car created to the highest of standards again within as little as 30 minutes. Our fully trained team are 24 hour emergency auto locksmiths so you can get to us when you need to. Our Hatfield Auto Locksmiths will always be prompt and professional regardless of the time of day that you call on them. Access Denied have trained staff working all over Hatfield meaning a member of the team of Auto Locksmiths is always within 30 minutes of reaching someone when they call. We will never make you wait longer than necessary to help you out.